Alberta premier Ed Stelmach has been described as hard working, reliable and an all-round nice guy. ‘Honest Ed’ is also a man of faith, a profoundly devout Ukrainian Catholic who prays regularly; and he sings in the choir at the church built by his grandparents. Interviewed at his office, Stelmach clarified the effect his faith has on his politics. 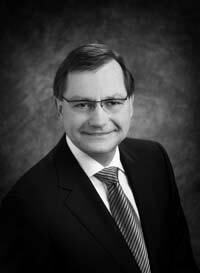 Stelmach, Alberta’s first Catholic premier, was born May 11, 1951, in Lamont, the fifth child of parents Nancy and Michael. Married for almost 34 years, Stelmach and his wife Marie met as teenagers at a neighbour’s wedding and have four adult children, three boys and a girl. They became grandparents about a year ago. God has always been important in their lives. “We go to church together, we pray together and we have always stressed strong family relations,” the premier said. Now 56, Stelmach is soft-spoken and remarkably modest, despite the fact he’s never ran in an election he didn’t win, from county council in 1986 to the race to succeed Ralph Klein last December. He exudes calm, making his guests feel at ease. The day after he won the election as Conservative Party leader he attended a service at St. Basil’s Church in Edmonton, where Father Daniel Wach gave him a special blessing. “We are fairly affluent as a province; not everybody is going to be at the same level obviously but certainly people should have a home and food,” he said. I will say, and this is something my parents and the church taught me, that God provides food for birds but he doesn’t deliver it to the birdhouse. So people have to be responsible; we have to help those that have disabilities or health issues.